Lovely Lennar built home just now 5 years old. 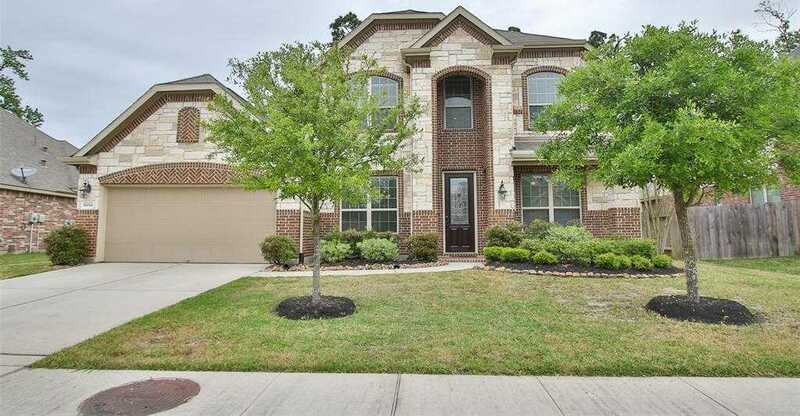 Extensive hardwood flooring throughout the foyer, study, formal dining, living, kitchen. Living has gas log fireplace. Beautiful island kitchen with granite and gas cook top. Super plan with master bedroom and 2nd bedroom on ground floor. Plus formal dining and study with French doors. Upstairs has the 2 additional bedrooms plus a game room and a media room. Spacious back yard. Subdivision has extensive walk ways and sidewalks for outdoor enjoyment. Even has a trail around 2 retention ponds, with catch and release. Community pool, club house with exercise equipment. And even a fishing pier on Lake Houston. Conveniently located near Beltway 8 for easy commute to Bush Airport, Ship Channel or Downtown. Approximately 5 miles to shopping at Beltway 8 or FM 1960. Never flooded per Seller.